Home » Health , Nature » Can Guavas Improve Your Heart Health And Much More ? Can Guavas Improve Your Heart Health And Much More ? Guavas are tiny fruits with a rich nutritional profile. Its high vit C content and antioxidants like lycopene benefits the cardiac health by improving the lipid profile, reducing oxidative stress, and preventing inflammation in the arteries. The potassium and fiber in guavas helps control heart rate and maintain healthy blood pressure, thus reducing your risk of heart disease. If you like guavas for their unique flavor, there’s good reason to chomp on. These refreshing fruits are little powerhouses of nutrients, be it vitamins, fiber, or antioxidants, helping rein in conditions ranging from the common cold and diabetes to even cancer. What’s more, they can reduce your risk of one of the deadliest diseases we face today – heart disease. Guavas pack in a vitamin C punch with every bite – the vitamin c content is supposed to be the highest among all fruits (yes, even more than oranges!). Guavas have so much vitamin C that one guava is enough to satisfy the daily recommended value. This abundant availability of C vitamin, a powerful antioxidant, also makes guavas heart-friendly. Vitamin C increases HDL or good cholesterol and lowers LDL or bad cholesterol. This super-vitamin helps prevent blood clots in the arteries (arterial thrombosis), a dangerous condition that can lead to heart attack. In one randomized study, patients with hypertension were given guava fruit before meals for 12 weeks. The lipid profile of the patients showed an average 9.9% drop in the total cholesterol levels, 7.7% drop in triglycerides and 8% rise in HDL cholesterol. Their blood pressure also reduced significantly. The vitamin C in guavas also helps in iron absorption and thus counters anemia. When left untreated, anemia can reduce the oxygen levels in your body, causing your heart to work harder and eventually resulting in cardiac conditions. Having guavas regularly can help improve hemoglobin levels and even treat mild anemia, as one adolescent-based study showed. Antioxidants prevent fats from oxidizing and causing cell damage. Oxidized fats can also deposit in your arteries and clog them, thus resulting in heart disease. Guavas are blessed with many antioxidants. The lycopene in guava is especially good news. Due to its impressive antioxidant properties, lycopene can act as an anti-atherogenic, preventing inflammation in the arteries. One study also showed that lycopene can possibly reverse cellular and DNA damage by reducing oxidative stress. About 100 gm of guava provides over 5 gm of fiber. – that’s almost 20% of your daily recommended value. A healthy dose of fiber is not just important for your digestive and bowel health, but is also associated with a happy heart. Many studies link regular dietary intake of fiber with lower cholesterol levels and a healthy cardiovascular system. High dietary fiber also assists in controlling blood sugar levels, thus keeping diabetes and the resulting risks of nerve damage and heart problems at bay. 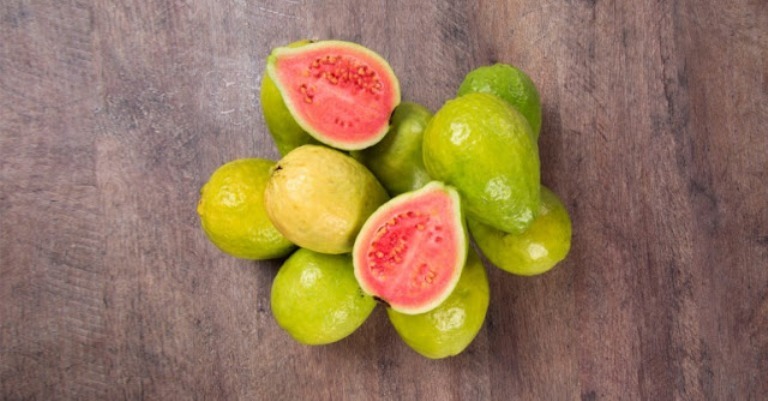 Another star ingredient in guava is potassium, a mineral that’s essential to maintain blood pressure. A spike in blood pressure can strain the arteries and heart. Low potassium levels are also associated with heart problems like palpitations and irregular cardiac rhythms. Guavas are a good source of potassium – 100 gm of guava gives you approximately 11% of the daily needed value. In Ayurveda, guava is considered a tridosha nashak, helping to balance vata, pitta, andkapha doshas. Guava juice mixed with lemon juice, rock salt, and black pepper when taken twice or thrice weekly is supposed to keep blood pressure in check.